Today at 4:00 (Eastern time), the world’s single largest sporting event, the World Cup, kicks off in Sao Paulo, Brazil. No other sport commands such universal enthusiasm as soccer (known by most of the world as football), and no other event draws as much of the world’s attention at one time as the World Cup. While the whole world competes at the Olympics, the whole world pays attention to the World Cup, a tournament held for a sport so democratic that anyone with four rocks and a ball can play. The event’s viewership spans the spectrum of humanity, uniting places as far apart–physically, socially, and culturally–as Buckingham Palace and the favelas of Rio de Janeiro, gluing people to their television sets on the slopes of Mt. Fujii, the steppes of Russia, the shantytowns of South Africa, and the sweltering streets of Mexico City. 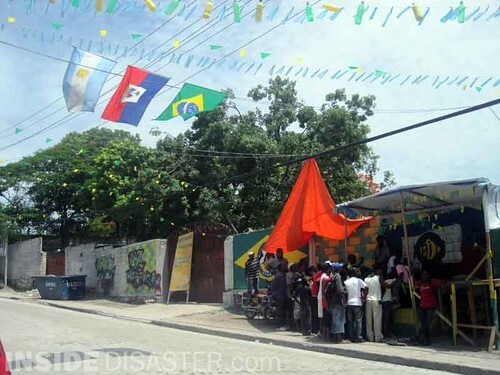 In Haiti, most people separate at this time of year into fans of one of two teams: Brazil or Argentina. The flags of these two countries can be seen flying from houses (often on opposite sides of the same street), cars, and motorcycles. Murals in green and yellow (Brazil) or blue and white (Argentina) adorn houses, shops, bridges and any other open space. Why these two teams? The quick answer is easy: they win. However, it’s too easy–so do plenty of other teams. In fact, three of the last four World Cup championships have been won by Spain, Italy, and France. It is extraordinarily rare, however, to find Haitians pulling for any European team. The most likely reason is that when most Haitians look at teams from the developed world, they seem like they inhabit another planet. When Haitians look at players from the developing world–many of whom grew up in grinding poverty in barrios or favelas not unlike the slums of Port-au-Prince–they see themselves. Or rather, they see themselves as they would like to be–wealthy, successful, victorious, and free from poverty. Ti Manno might live in Cité Soleil on $2 a day, but he can live vicariously through Neymar or Maradona and dream of the world as it ought to be.